Ray's wife Annie (Amy Madigan) is semi-supportive but worried about their finances. No one but those who believe can see the ghostly ballplayers who begin to appear. The ghosts of "Shoeless" Joe and other Sox players, disgraced in the 1919 scandal, come back from the dead, and appear for a few games with Ray - to be rehabilitated. Joe Jackson - who had been banned from 'America's pasttime' during the 1919 Black Sox scandal, makes the most memorable mystical appearance (or materialization) in the baseball field. The sighting of the dead baseball player, idolized by Ray's father, occurs after Karin tells her father one evening: "Daddy?... There's a man out there on your lawn." Ray's wife encourages him to go on outside, while she makes coffee. The shadowy figure kneels down in the grassy ball park and touches the grass, then is amazed as Ray switches on the park's lights to illuminate him. He turns to face Ray as he strides onto the field, and nods in acknowledgement. Man, I did love this game. I'd have played for food money. It was the game, the sounds, the smells. Did you ever hold a ball or a glove to your face?...I used to love traveling on the trains from town to town. The hotels, brass spittoons in the lobbies, brass beds in the rooms. It was the crowd rising to their feet when the ball was hit deep. Shoot, I'd play for nothing. He asks: "Can I come back again?" He is planning to return with seven other banned players on his team who also miss the game. Just before his departure, before trotting off toward a surrounding cornfield and disappearing, he asks: "Hey, is this heaven?" Ray smiles: "No, it's Iowa." Ray travels to Boston to see controversial 60s writer, a disillusioned and reclusive, J.D. Salinger-like Terence Mann (James Earl Jones), to help him seek out the meaning of the voices and the purpose for the field. The one constant through all the years, Ray, has been baseball. America has rolled by like an army of steamrollers. It's been erased like a blackboard, rebuilt, and erased again. But baseball has marked the time. This field, this game, is a part of our past, Ray. It reminds us of all that once was good, and that could be again. Oh people will come, Ray. People will most definitely come. He also meets with a small town doctor, Dr. "Moonlight" Graham (Burt Lancaster in his final theatrical film role), a rookie player who years earlier yearned to make it into the major leagues, but whose pro baseball career was limited to only one inning. The ballfield becomes a place where people who have sacrificed parts of their lives for others are given a second chance. Instead, the voices are actually Ray's own internalized desire (Ray: "It was you" Joe: "No, Ray. It was you") to allow his estranged ghostly father John Kinsella (Dwier Brown) to appear for reconciliation. He reacts with great surprise. Oh, my God...It's my father... ('Ease his pain.' 'Go the distance.')... My God. I-I only saw him years later when he was worn down by life. Look at him. He's got his whole life in front of him, and I'm not even a glint in his eye. What do I say to him? His wife Annie suggests that John meet his granddaughter Karin. When father and son speak alone, John says: "For me, it's like a dream come true. Can I ask you something? Is-is this heaven?" Ray responds, typically: "It's Iowa." John replies: "I could have sworn it was heaven...It's the place dreams come true." Ray ponders: "Maybe this is heaven." And then, slightly choked up, he requests: "Hey Dad? You want to have a catch." The two enjoy a game of catch between father and son one more time as the sun sets. 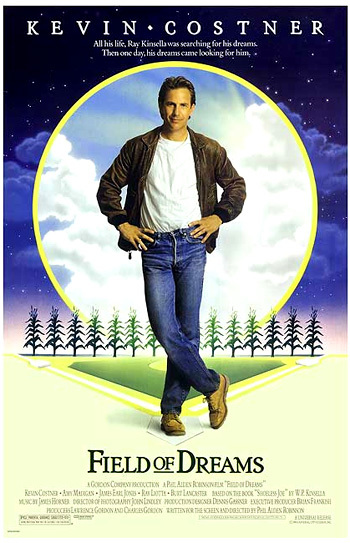 The film ends with a stream of cars (and headlights) approaching the ballfield in the middle of the Iowa cornfield, signaling that Ray isn't going to lose his farm after all.